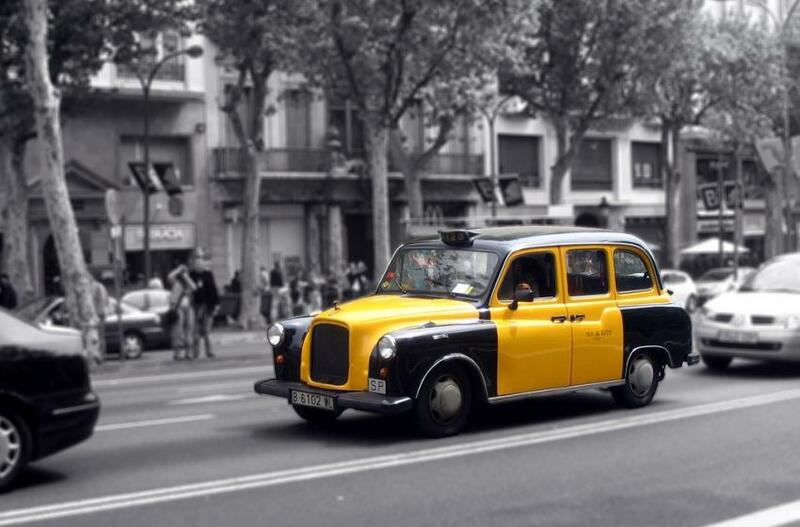 Black and yellow and never far away in the city centre, Barcelona taxis are run by several different companies. You can book one on line with the My Taxi app. All taxis are metered. The day rate (8am-8pm) starts at €1.07/km, nights and weekends €1.18/km. There is a minimum €2.10 fee when you get in a cab. You can pay by credit card. That seems very cheap—but waiting time is metered at €20.44 per hour, and there are surcharges for journeys to the airport, Sants station, the Moll Adosssat (cruise terminal) and the convention centre, Fira de Barcelona Gran Via. There's a €1 charge for each piece of luggage. There's a flat rate fare of €39 between the Airport and Moll Adossat Cruise Terminal. An additional €2 is charged from midnight to 6am on Fri, Sat, Sun and public holidays. On very special holidays (23-24 June, Christmas and New Year's Day), the surcharge is €3.10 from 8pm-8am. You can get fare estimates here. TAXI GROC +34 93 322 22 22 Drivers often speak English. TAXI AMIC +34 93 420 8088. Vehicles suited for people with limited mobility. ECO TAXI BARCELONA +34 932 783 000 Hybrid vehicles with rree WIFI and a smartphone charger. There's a fixed call out fee of €4.20 (€3.40 nights), and a minimum €7.00 fare. Most taxis can take up to four passengers, but a few van taxis will take six; these should be booked in advance.